William married Malcena Barbre about 1872. Malcena was about seventeen years old then; they had ten children. William moved to Sullivan County (Indiana, township of Jackson) where he owned and operated a coal mine. He later moved to Terra Haute where he also operated a coal mine for three or four years. He then moved to Hymera. He operated a coal mine there until about 1889, when the Chicago Company leased all the coal around them and started to build up the town. But when the first three buildings that went up were two saloons and a gambling hall, grandfather packed his family in a covered wagon and started for Wayne County, Iowa, which was a prohibition state. He died there. *Curryville was in Curry Township, and 5 miles west of Hymera. There’s nothing there now, except the rail tracks. This is all supported by census information. William and his brother Benjamin were still in Illinois with their parents in 1870. However over in Sullivan County Indiana, the 1870 census for the household of Milton Stark (called William Sterk in that census) included his wife Angeline (Barbre) Stark, 3 of their own children, plus widow Susan Barbre and three of her children, Lucy Barbre, Malcena Barbre, and Ann M Barbre. In the 1880 census for Jackson Township, Sullivan County, Indiana, the households of Milton Stark, Benjamin Coffey, and William Coffey were adjacent. Milton was a “coal operator”, and his household included Angeline (Barbre) and her sister Ann M Barbre was still a household guest. Benjamin Coffey (also a coal operator”) had married Lucy Barbre, and they had 3 children. 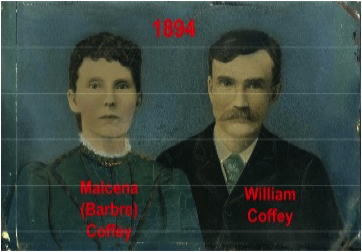 William Coffey (a ”laborer”) had married Malcena Barbre, and they had 4 children. The labels make it sound like Milton and Benjamin were the business owners, and little brother William was the “worker”? And the Barbre sisters were the link bringing everyone together. Since Benjamin married Lucy Barbre in early 1871, that is probably about the time Ben relocated from Illinois to Indiana. William reportedly married Malcena in October 1872. This all seems consistent with starting mining in 1873. When wife Lucy died in 1887, Ben went back to the Stark household to find his second wife, Ann Barbre. Also found in Index to Vigo County birth records a child born 5 Apr 1885 to “Celia Barber” and “Wm. Coffey”. That would be Vivian. THE BIG MOVE: The two Coffey brothers moved their families to Iowa in September 1890. A history of the Unity Baptist Church in Clay Twp, Wayne County, lists Ben Coffey, and Mr. & Mrs. William Coffey, as among the 13 persons who decided to form this church. 1895 IOWA CENSUS: Household headed by William (47) and Malcena (39). Cresse (21) and Newton (20) are assisting with the farm. Also at home are Elmer (16), Clyde (13), Benjamin (6), Ethel (3), and Loran (1). They are all Baptists. The oldest 3 boys were born in Illinois, Clyde & Ben in Indiana, and the Ethel and Loran were born in Wayne, Iowa. "A sad accident happened five miles south of town on last Monday morning, resulting in the death of Wm. Coffey. He was assisting at a horse power wood saw, and the belt coming off, he started to stop the power, when the tumbling rod between the power and the jack came apart and one portion struck Mr. Coffey on the back of the head with such force as to knock him several feet and kill him instantly. An inquest was held which gave a verdict in accordance with above facts. Mr. Coffey was esteemed by all who knew him, and his death causes deep regret. He leaves a wife and six children, who have the heartfelt sympathy of all. The funeral services will be held this afternoon at his home." The horse(s) walked in a circle, turning a gear in the center. The power was transmitted from the "power" in the center to the machinery, via the "tumbling rod" lying across the ground - -which the horses had to step over on each circuit. If this were a "wood saw", the saw would be the machine on the right. The above is obviously a "one horsepower" unit. Following shows a unit with six "sweeps", each sweep powered with a "team" of horses or mules. That would be a "twelve horsepower" unit, and it is being used to run a threshing machine. She was hard to find, was recorded as "Seena Coffee", and that got indexed as "Coffer"! 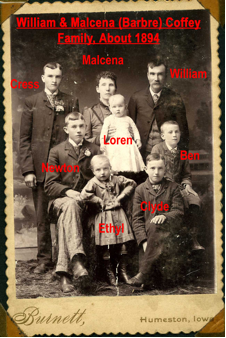 Children Elmer, Clyde, Bennie, Ethel and Loren are living at home. Her mother-in-law Martha (Vermillion) Coffey is also in the household. She has had 11 children, and 7 are living. (Memo: Cress and Newton have their own households in 1900.) She was born in Indiana, her father was born in Indiana, and her mother was born in Kentucky. The three oldest children were born in Indiana, the younger two in Iowa. Sons Elmer and Clyde are the farmers, the younger children are all in school. NOTES FROM 1910 CENSUS, IOWA, WAYNE CO.
Malcena lives on farm adjacent to her son Newton. Living at home are her daughter Ethel age 18, and her son Loren age 16. She has had 11 children, of whom 6 are still living. They own the farm and have no mortgage. She lists her occupation as “Manager” of the farm, with Loren being the “Farm Laborer”. NOTES FROM 1920 CENSUS, IOWA, WAYNE CO., CLAY TWP. NOTE: This adjacent picture was likely done very shortly after William's death. It appears to have been made from the earlier family photo. RECOLLECTIONS OF VELMA: About flu epidemic in about 1918. During that flu, Uncle Ben’s wife (I she’s talking about Newton’s brother Ben) went to take care of her parents because none of the other children could. Both her parents died of the flu. Grandma (Malcena) moved into their house to take care of her sons’ two small children. Gertrude sent Carol and Velma over to help with the housework and two small children. Grandma was making bread, set it aside to rise and then took a nap. The rising bread pushed the lid onto the floor. Grandma (Malcena) then started scolding Carol and Velma for making trouble. Velma was most impressed with her grandma’s spiritual life. She loved the lord, and read her bible daily. She was a spiritual prayer warrior for the lord, she was always praying for other people. She always prayed that at least one of her children would become a missionary, but she died before learning that Velma had fulfilled that wish. Mrs Mal Scena (sic) Barbre Coffey was born March 28, 1885 (sic), near Farmersburg, Vigo County, Indiana. She was united in holy matrimony to William Coffey in October 1872, in Christian County, Illinois. To them were born eleven children, six sons and five daughters. Two of these were born in Iowa. Mr. And Mrs. Coffey and five sons came from Indiana to Iowa as settlers in September 1890 and have been noble citizens of this state ever since. Mrs. Coffey was converted in her early childhood, joined the Methodist church in Indiana and after coming to Iowa she united with the Unity Baptist Church of which she has been a faithful and active member until death. She was a very deep, earnest and sympathetic Christian, not being satisfied by being saved alone but that all her children and many others were won into the Kingdom by her life and influence. She was taken ill, at the home of her son Benny Coffey on Nov. 27 and was tenderly cared for by her children and friends. Mother Coffey passed away to be with the Lord Dec. 5th, 1920, aged 65 years, 8 months and 7 days. She leaves to mourn her loss five sons and one daughter. Interment in the Kirby cemetery. William and Malcena are both buried in Kirby Cemetery, Cambria, Wayne, Iowa. Their sons Cresse and Elmer are also buried there.